A Democratic candidate for governor in Wisconsin, one of the biggest critics of a deal bringing thousands of jobs to the state, only sought information on the "risks" of the deal before coming out in opposition, documents obtained by the Washington Free Beacon show. The candidate also appears to have done little work on an amendment to the Foxconn legislation that he regularly touts. Dana Wachs, a state assemblyman who was the first Democratic candidate to oppose legislation supporting Taiwanese tech company Foxconn building a factory in Wisconsin, called it a "bad deal" shortly after Republican Gov. Scott Walker approved the $3 billion incentive package for the company to build a factory in the state. "I strongly oppose a deal that would put Wisconsin tax payers on the hook until 2043 and bring Chinese-style economics to Wisconsin, complete with air and water pollution and reckless government giveaways," Wachs said in a August 13 press release. "I have always supported bringing in good jobs. That's something I've worked on in Eau Claire and across party lines in Madison. But Foxconn is a bad deal for Wisconsin, and I am against it." Emails obtained by the Free Beacon show that Wachs sent just one email seeking only the "risks" of the deal. "Contact this group [Wisconsin Safety Council] to find out what the manufacturing process risks of Foxconn will be," Wachs wrote in an August 10 email to staffers Bob Meyer and Leonard Riley. This was the only email that Wachs sent in relation to his work with Foxconn, which was initially obtained using open records requests. On August 13, days after the email was sent, Wachs announced his opposition. Wachs regularly touts his "Good Jobs" amendment to Gov. Scott Walker's Foxconn legislation, which he co-authored with Democratic State Rep. Christine Sinicki. Emails show that Sinicki's office appears to have done almost all of the work on the amendment despite Wachs being its coauthor. State Rep. Sinicki sent an email on August 1 to legislative assembly Democrats giving them a "heads up" on the amendments. Three days later, on August 4, Mike Pearson, a staffer in Sinicki's office, sent an email to Meyer and Riley in Wachs office informing them that had sent out a Foxconn release to the Wheeler Report, WisPolitics, Journal Sentinel, and a few local papers. An hour later, Pearson sent another email to Meyer and Riley with a quick summary of two Foxconn amendments and told them to let him know if they can provide any further information. "Unless he's exploiting the system for himself and his trial attorney pals, Dana Wachs is all talk and no action," Alec Zimmerman, spokesman for the Wisconsin Republican Party, told the Free Beacon. "While Governor Walker delivers big wins for hard-working Wisconsin families, Wachs is trying to score political points by providing token opposition to tens of thousands of new jobs." Zimmerman is also referencing legislation that Wachs sponsored that Republicans said could benefit his work as a trial attorney and his law firm, the Journal Sentinel reported. Wachs and Sinicki's office did not respond to inquiries by press time. 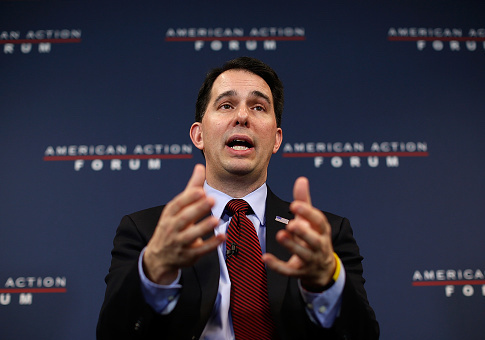 This entry was posted in Issues and tagged Jobs, Scott Walker, Wisconsin. Bookmark the permalink.